Like a latter-day political Houdini, Israeli Prime Minister Benjamin Netanyahu has tied himself into a straitjacket, his fate inextricably tied to that of his lifelong archenemy, Iran. Netanyahu has devoted the better part of his long public career to sounding the warning about the dangers posed by Iran. He has been assisted in this task by the Islamic government in Tehran, which for decades has embarked on a path that includes support for international terror, assassination plots, repeated threats to Israel’s existence and, yes, a hidden nuclear program. 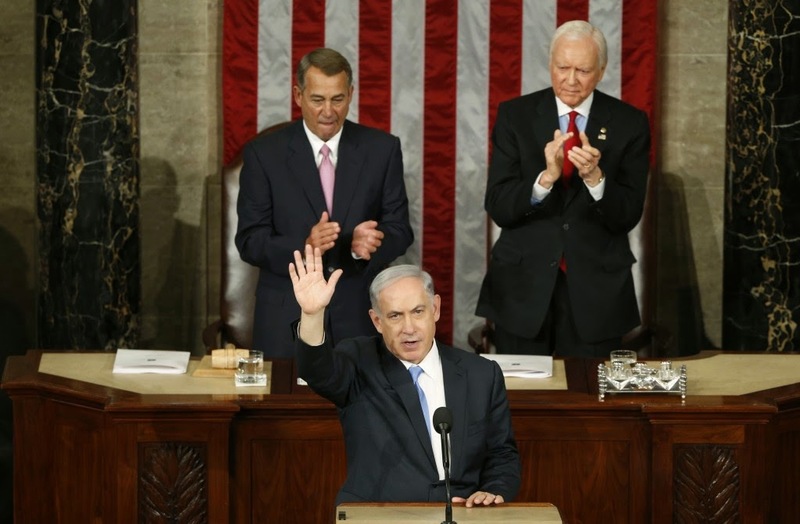 Netanyahu’s efforts were not for naught. Europe’s and the United States’ engagement with Iran and the framework nuclear agreement announced last week is by almost every measure the result of Netanyahu’s assiduous insistence on this subject. But no, he is not taking a victory lap. He has instead set the Israeli government on a path of continued confrontation with the United States that President Barack Obama now seems eager to take on. “I’m trying to kill a bad deal,” Netanyahu said over the weekend in his appearances on three U.S. Sunday morning news shows. As if in an afterthought, Netanyahu dispatched his minister of intelligence and strategic affairs, the hard-line Yuval Steinitz, to issue a list of Israeli demands that, if accepted, would make the deal “more reasonable.” The amendments appear to be a restatement of clarifications and critiques put forward by skeptics. In one of the greatest ironies of the moment, Hezbollah, the Lebanon-based paramilitary group armed and financed by Iran, announced its enthusiastic support for the deal. Hassan Nasrallah, its leader, told the Syrian news channel al-Ikhbariya TV that “there is no doubt the Iranian nuclear deal will be big and important to the region … God willing.” The agreement “rules out the specter of regional war and world war” that would result from an Israeli attack on Iran’s nuclear facilities, he added. How has Netanyahu, long considered a deft operator on the international stage, found himself opposing his nation’s No. 1 ally at the very moment he achieved one of his life’s great goals: obstructing the threat of a nuclear bomb aimed at Tel Aviv? He did it by abandoning the Israeli national interest he has championed in favor of his private political fortunes. Netanyahu repeated the same points he’s been making for years and offered no new alternative to a nuclear deal that at that point did not yet exist. And then, Netanyahu’s poll numbers dipped. It didn’t have to be that way. A principal reason for the wide-ranging international reaction that the Iran deal looks “better than expected ” is that the public believed Netanyahu’s admonitions about how bad it was going to be. Netanyahu has now made himself superfluous to the talks — and all but invited Obama’s growing antagonism. Smoke rises up in the sky, following Israeli airstrikes in Gaza City, Saturday, Aug. 23, 2014. GAZA CITY, Gaza Strip — Israeli aircraft fired two missiles at a 12-story apartment tower in downtown Gaza City on Saturday. They collapsing the building, sent a huge fireball into the sky and wounded at least 22 people, including 11 children, witnesses and Palestinian officials said. Israel has launched some 5,000 airstrikes against Gaza in nearly seven weeks of fighting with Hamas, but Saturday's strike marked the first time an entire high-rise was toppled. The explosion shook nearby buildings. Gaza police said Israeli aircraft fired a warning missile at the roof of the tower at dusk, followed five minutes later by two missiles with explosives. Ayman Sahabani, head of the emergency room at Gaza City's Shifa Hospital, said at least 22 people were wounded, including 11 children and five women. Earlier Saturday, the Egyptian Foreign Ministry urged Israel and Hamas to resume indirect talks, and agree to an open-ended cease-fire. The appeal came after Western-backed Palestinian President Mahmoud Abbas met with Egyptian President Abdel-Fattah el-Sissi in Cairo. Egyptian officials did not say how they expected renewed talks to produce a different outcome after repeated failures. Israeli government spokesperson Mark Regev had no immediate comment regarding the renewed call for a cease-fire. Sami Abu Zuhri, a spokesman for Gaza's ruling Hamas, said the group would consider the Egyptian appeal, but there was no sign it would budge from longstanding demands. In the United States, protesters unfurled a giant Palestinian flag from New York's Brooklyn Bridge in support of Palestinians in Gaza. Israel's Prime Minister Benjamin Netanyahu attends the weekly cabinet meeting in Jerusalem August 17, 2014. Prime Minister Benjamin Netanyahu said on Sunday any deal on Gaza's future at truce talks in Cairo must be contingent on Israel's security needs, cautioning Hamas against carrying out its threat of a long war if Palestinian demands are not met. With a five-day ceasefire due to expire late on Monday, negotiators were to reconvene in the Egyptian capital to seek an end to five weeks of hostilities that have killed more than 2,000 people. Both sides say gaps remain in reaching a long-term deal that would keep the peace between Israel and militant groups in the Hamas Islamist-dominated Gaza Strip, and open the way for reconstruction aid to reach the battered enclave. Hamas wants Israeli and Egyptian blockades of the Gaza Strip lifted, as well as the establishment of a seaport and airport, as part of any enduring halt to violence. Israel, which launched its offensive on July 8 after a surge in cross-border Hamas rocket attacks, has shown scant interest in making sweeping concessions, and has called for the disarming of militant groups in the territory of 1.8 million people. Netanyahu, in public remarks to his cabinet, said Hamas should not underestimate Israel's resolve to battle on. "Only if there is a clear response to our security needs will we agree to reach understandings," he said. "If Hamas thinks that through continued intermittent firing it will cause us to make concessions, it is mistaken. 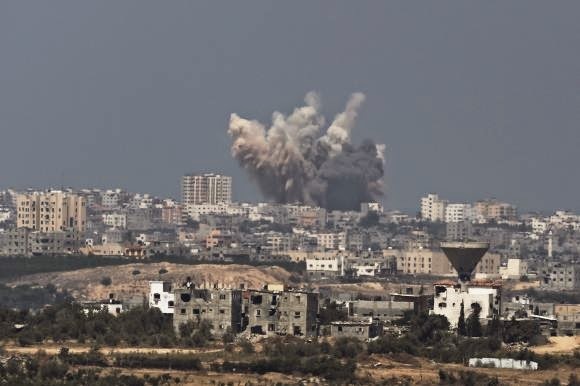 For as long as quiet does not return, Hamas will continue to absorb very harsh strikes." The Gaza offensive has had broad public support in Israel, where militants' rockets, many of them intercepted by the Iron Dome anti-missile system, have disrupted everyday life but caused little damage and few casualties. Commenting on Netanyahu's remarks, Hamas spokesman Sami Abu Zuhri said: "The only way to achieve security is to afford security to the Palestinians first and to lift the blockade and to agree to their demands." On Saturday, Osama Hamdan, the head of Hamas's foreign affairs, said on Facebook: "Israel must accept the demands of the Palestinian people or face a long war." The United Nations said 425,000 people in the Gaza Strip have been displaced by the war. The Palestinian Health Ministry in the enclave says 1,980 Palestinians, most of them civilians, have been killed in the conflict. On the Israeli side, 64 soldiers and three civilians have been killed. Egyptian and Palestinian sources have said that at the Cairo talks Israel had tentatively agreed to relax curbs on the movement of people and goods across the border, subject to certain conditions. Israeli Communications Minister Gilad Erdan, a member of Netanyahu's security cabinet, said Israel was examining the Egyptian proposal as a whole and had yet to make any final decision. "There are sections that are problematic as far as Israel is concerned," Erdan said on Israel Radio, without elaborating. The Palestinian demand for a Gaza sea port and reconstruction of an airport destroyed in previous conflicts with Israel has been a stumbling block, with Israel citing security reasons for opposing their operation. Israel and Hamas have not met face-to-face in Cairo: Israel regards Hamas, which advocates its destruction, as a terrorist group. The Palestinian delegation includes representatives of Hamas and U.S.-backed President Mahmoud Abbas, who brought his former Islamist rivals into a unity government in April. Smoke rises in the Gaza Strip after an Israeli strike August 8, 2014. Israel launched more than 20 aerial attacks in Gaza on Saturday, killing five Palestinians, and militants fired rockets at Israel as the conflict entered a second month, defying international efforts to negotiate an agreement for an extended ceasefire. Medical officials in Gaza said two Palestinians were killed when their motorcycle was bombed and the bodies of three others were found beneath the rubble of one of three bombed mosques. The air strikes which lasted through the night also bombed three houses, and fighter planes also strafed open areas, medical officials said. 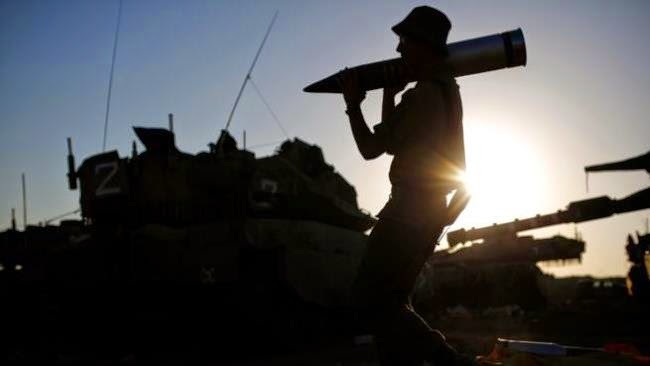 The Israeli military said that since midnight it had attacked more than 30 sites in the coastal enclave where Hamas Islamists are dominant, without specifying the targets. Gaza militants fired six rockets at towns in Israel's south on Saturday setting off alarm sirens and causing no damage or injuries, a military spokeswoman said. Violence also picked up in the occupied West Bank, the Palestinian territory where President Mahmoud Abbas's Fatah movement holds sway, where a Palestinian man, 43, died of a gunshot wound to the chest from a confrontation with Israeli soldiers in the city of Hebron, medical officials said. Israeli troops shot and killed another Palestinian man, 20, on Friday at a protest near a Jewish settlement outside Ramallah, Israeli military officials said. Egypt, helped by American and European mediators, has made no visible progress toward resuming a 72-hour ceasefire that halted the fighting between Israel and Gaza militants that began on July 8, but was expected to pursue these efforts again on Saturday. The ceasefire expired on Friday with the sides still far apart on the terms for renewing the deal and each side blaming the other for refusing to extend it. Israel accused Hamas of firing several rockets about four hours before the deal expired at 8 a.m. (0500 GMT). In all, Gaza militant fired 57 rockets at Israel throughout Friday. Israel also launched air strikes in Gaza on Friday, killing five Palestinians, among them a 10-year-old boy near a mosque in Gaza City. An Islamic Jihad militant and three other Palestinians were killed in the southern Gaza Strip. Police said two people in Israel were injured by mortar fire from Gaza on Friday. By resuming attacks against Israel, Gaza militants appeared to be trying to ramp up pressure and making it clear they were ready to fight on to fulfill a goal of ending a blockade of the territory that both Israel and neighboring Egypt have imposed. 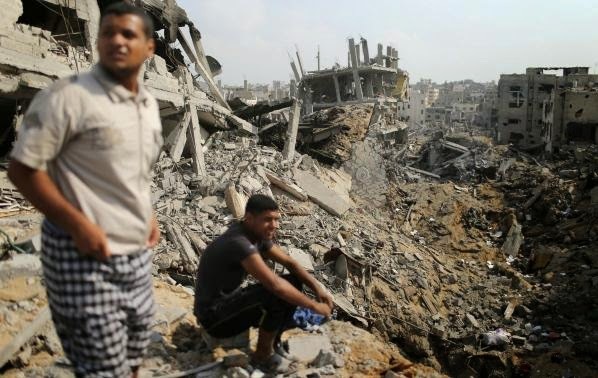 Gaza officials say the war has killed 1,886 Palestinians, most of them civilians. 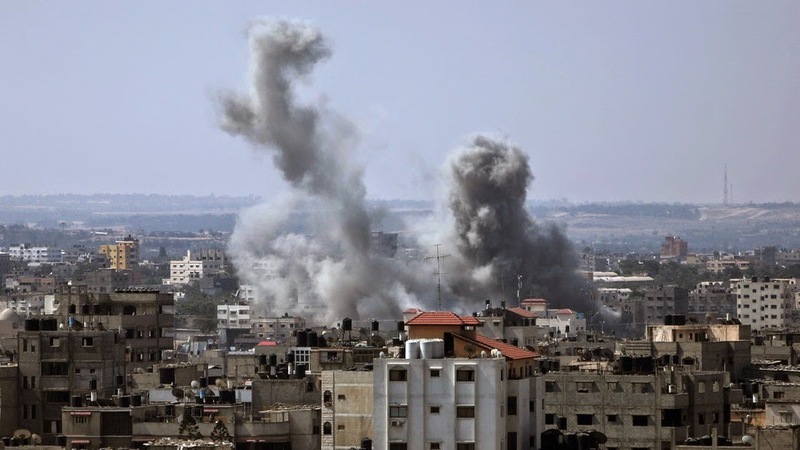 It expanded its air and naval bombardment of the Gaza Strip into a ground offensive on July 17, and pulled its infantry and armor out of the enclave on Tuesday after saying it had destroyed more than 30 infiltration tunnels dug by militants. The White House urged Israel and the Palestinians to do what they could to preserve civilians after having failed to extend their ceasefire. Spokesman John Earnest said on Friday "the United States is very concerned" about the renewed violence. "We condemn the renewed rocket fire and we are concerned about the safety and security of civilians on both sides of the conflict," Earnest said. U.N. Secretary-General Ban Ki-moon issued a similar statement urging the parties "not to resort to further military action that can only exacerbate the already appalling humanitarian situation in Gaza." Hamas did not agree. Hamas spokesman Sami Abu Zuhri said Israel had rejected most of the group's demands. He said the Palestinians had wanted Israel to agree in principle to lift a Gaza blockade, release prisoners and permit the opening of a sea port, but these had been rebuffed. "However, we did not close the door and will continue with the negotiations," Abu Zuhri said. Israeli Justice Minister Tzipi Livni, a member of Prime Minister Benjamin Netanyahu's security cabinet said the issue of a sea port should be part of wider peace negotiations with the Palestinians and that Hamas should not at this time be rewarded for "using force against Israeli citizens." In Cairo, the foreign ministry called for a resumption of the ceasefire, saying only a few points remained to be agreed. Egypt mediates the talks but is meeting separately with each party. Israel and Hamas deny each other's legitimacy, with Hamas rejecting Israel's right to exist and Israel rejecting Hamas as a terrorist organization. Gaza/Jerusalem: Palestinian militants in the Gaza Strip resumed rocket fire into Israel on Friday after Egyptian-mediated talks in Cairo failed to extend a 72-hour truce in a nearly month-long war. As police said rocket-warning sirens were sounding in southern Israel, the military's "Iron Dome" interceptor system brought down a missile over the southern city of Ashkelon. A military spokesman said on Twitter: "After the 72-hour ceasefire, Hamas resumes indiscriminate rocket fire at Israel. At least 5 rockets launched - one intercepted over Ashkelon." The Palestinians had wanted Israel to agree in principle to demands which include a lifting of a blockade on the Gaza Strip, the release of prisoners and the opening of a sea port. The armed wing of Hamas released a statement late on Thursday warning Palestinians negotiators not to agree to an extension unless Israelis offered concessions. There was no sign that Israel had made any such moves. Israel also made it clear that it would respond forcefully if attacked and a minister raised the prospect of re-taking control of the Gaza Strip to overthrow its Hamas rulers. "Israel will act with force if Hamas resumes its fire and to my mind we will have, this time, to seriously consider, although not with enthusiasm, the option of taking control of the Gaza Strip in order to topple the Hamas regime," Strategic Affairs Minister Yuval Steinitz said on Army Radio. Gaza officials say the war has killed 1,875 Palestinians, most of them civilians. Hamas said on Thursday it had executed an unspecified number of Palestinians as Israeli spies. Hamas refusal to extend the ceasefire could further alienate Egypt, whose government has been hostile to the group and which ultimately controls Gaza's main gateway to the world, the Rafah border crossing. The Israelis described the ceasefire as a tradeoff of "calm for calm". They have shown little interest in easing their naval blockade of Gaza and controls on overland traffic and airspace, worrying Hamas could restock on weapons from abroad. Israel withdrew its ground forces from Gaza on Tuesday, shortly before the truce began. Palestinians look at destroyed houses after returning to the Shejaia neighbourhood, which witnesses said was heavily hit by Israeli shelling and air strikes during the Israeli offensive, in the east of Gaza City August 5, 2014. Israel withdrew ground forces from the Gaza Strip on Tuesday and started a 72-hour ceasefire with Hamas mediated by Egypt as a first step towards negotiations on a more enduring end to the month-old war. Minutes before the truce began at 8 a.m. (0500 GMT), Hamas launched a salvo of rockets, calling them revenge for Israel's "massacres". Israel's anti-missile system shot down one rocket over Jerusalem, police said. Another hit a house in a town near Bethlehem in the occupied West Bank. There were no casualties. Israeli armour and infantry left Gaza ahead of the truce, with a military spokesman saying their main goal of destroying cross-border infiltration tunnels dug by Islamist militants had been completed. "Mission accomplished," the military tweeted. Troops and tanks will be "redeployed in defensive positions outside the Gaza Strip and we will maintain those defensive positions", spokesman Lieutenant-Colonel Peter Lerner said, reflecting Israeli readiness to resume fighting if attacked. Sami Abu Zuhri, a spokesman for the Islamist Hamas faction that rules Gaza, said Israel's offensive in the densely populated, coastal enclave was a "100 percent failure". Israel sent officials to join talks in Cairo to cement a longer-term deal during the course of the truce. Hamas and Islamic Jihad also dispatched representatives from Gaza. Israeli Prime Minister Benjamin Netanyahu convened his decision-making security cabinet to discuss the aftermath of the fighting, officials said. In Gaza, where some half-million people have been displaced by a month of bloodshed, some residents, carrying mattresses and with children in tow, left U.N. shelters to trek back to neighbourhoods where whole blocks have been destroyed by Israeli shelling and the smell of decomposing bodies fills the air. Sitting on a pile of debris on the edge of the northern town of Beit Lahiya, Zuhair Hjaila, a 33-year-old father of four, said he had lost his house and his supermarket. "This is complete destruction," he said. "I never thought I would come back to find an earthquake zone." Visiting International Red Cross President Peter Maurer, responding to local criticism that his organisation was late in helping some victims, said "we were insufficiently able to bridge the gap between our willingness to protect them and our ability to do so". The head of Israel's southern command reassured residents who had fled southern Israeli towns when fighting erupted that it was safe to return home, though some remained unconvinced the threat of attack tunnels and rockets from Gaza had been wiped out. TRUCE ATTEMPTS Several previous truce attempts by Egypt and other regional powers, overseen by the United States and United Nations, failed to calm the worst Israeli-Palestinian fighting in two years. An Israeli official said that in the hour before the ceasefire came into effect, the civilian airspace over Tel Aviv was closed as a precaution against Gaza rockets, delaying takeoffs and landings at Ben-Gurion Airport. Gaza officials say the war has killed 1,867 Palestinians, most of them civilians. Israel says 64 of its soldiers and three civilians have been killed since fighting began on July 8, after a surge in Palestinian rocket launches. Hamas said it had informed Egypt "of its acceptance of a 72-hour period of calm", beginning on Tuesday. The Palestinian cabinet issued a statement after its weekly meeting in Ramallah welcoming the ceasefire. The U.S. State Department also welcomed the truce and urged the parties to "respect it completely". Spokeswoman Jen Psaki said Washington would continue its efforts to help the sides achieve a "durable, sustainable solution for the long term". Efforts to turn the ceasefire into a lasting truce could prove difficult, with the sides far apart on their central demands, and each rejecting the other's legitimacy. Hamas rejects Israel's existence and vows to destroy it, while Israel denounces Hamas as a terrorist group and eschews any ties. Besides the truce, Palestinians demand an end to the Israeli-Egyptian blockade on impoverished Gaza and the release of prisoners, including those Israel arrested in a June crackdown in the occupied West Bank after three Jewish seminary students were kidnapped and killed. Israel has resisted those demands in the past. Palestinian Foreign Minister Riad al-Malki said there was "clear evidence" of war crimes by Israel during its offensive in Gaza as he met International Criminal Court prosecutors in The Hague on Tuesday to push for an investigation. Both sides have traded allegations of war crimes during the Gaza assault, while defending their own actions as consistent with international law. ISRAEL: DEMILITARISE GAZA Lerner said the army overnight had destroyed the last of 32 tunnels located inside Gaza and which had been dug by Hamas for cross-border ambushes at an estimated cost of $100 million. Israeli officials say, however, that some tunnels may have gone undetected and that the armed forces are poised to strike at these in the future. 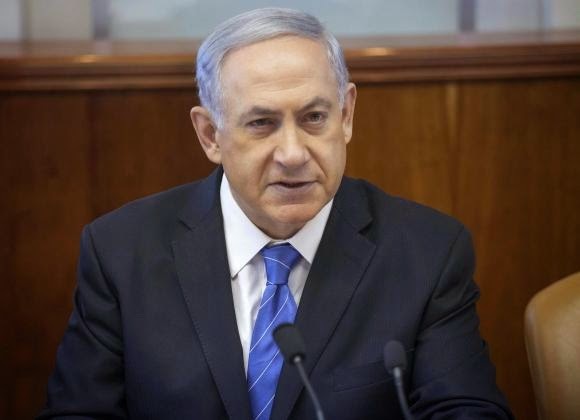 Netanyahu also wants to disarm Hamas and demilitarise Gaza, after guerrillas launched more than 3,300 rockets and mortar bombs at Israel in the past month. Hamas has ruled that out. 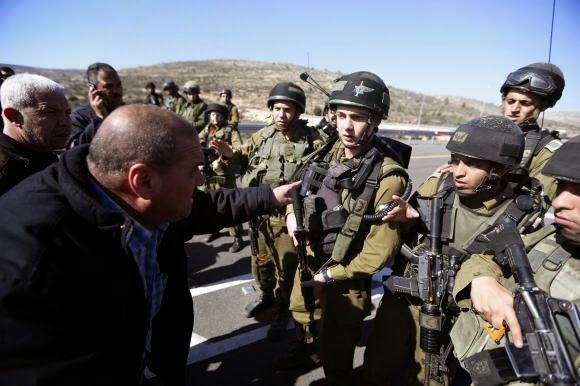 "For Israel the most important issue is the issue of demilitarisation. We must prevent Hamas from rearming, we must demilitarise the Gaza Strip," Netanyahu spokesman Mark Regev told Reuters television. Since the fighting began, several previous truces barely held. Regev said Israel had accepted Egypt's terms weeks before Hamas, and expressed a wish that the truce would last: "I hope this time we see the ceasefire work that's good for everybody." Egypt has positioned itself as a mediator in successive Gaza conflicts but, like Israel, its current administration views Hamas as a security threat. Besides the loss of life, the war has cost both sides economically. Gaza faces a massive $6-billion price tag to rebuild devastated infrastructure. Israel has lost hundreds of millions of dollars in tourism and other sectors and fears cuts in overall economic growth this year as well. Israel's Tourism Minister said that, while there has been a steep drop in the number of visitors to the Holy Land, he expected things to bounce back in a few months. Palestinian officials said a donor conference to raise funds for Gaza's reconstruction would be held in Oslo next month. In London, a British minister, Sayeeda Warsi, resigned on Tuesday, saying she could not support government policy on the war. Prime Minister David Cameron's government has been pressing for a ceasefire in Gaza, but he has been criticised by the opposition for refusing to describe Israel's military actions in Gaza as disproportionate. 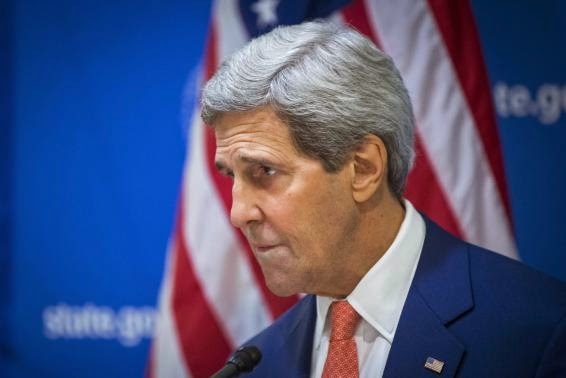 U.S. Secretary of State John Kerry announces a 72-hour humanitarian ceasefire between Israel and Hamas, while in New Delhi August 1, 2014. - Israel and Palestinian militant groups in the Gaza Strip have agreed to a three-day humanitarian truce to begin Friday morning, and negotiators from both sides will travel to Cairo to discuss a longer-term solution. The 72-hour break after more than three weeks of fighting was set to begin at 8 a.m. (0500 GMT), according to a joint statement released by U.S. Secretary of State John Kerry and U.N. Secretary-General Ban Ki-moon. An official in Prime Minister Benjamin Netanyahu's office said Israel had accepted the U.S./U.N. proposal. A spokesman for Hamas, the Islamist group dominant in Gaza, said all Palestinian factions would abide by the truce. "We urge all parties to act with restraint until this humanitarian ceasefire begins, and to fully abide by their commitments during the ceasefire," Kerry and Ban said. "This ceasefire is critical to giving innocent civilians a much-needed reprieve from violence." Hours before the ceasefire was announced, Netanyahu, facing international alarm over a rising civilian death toll in Gaza, said he would not accept any truce that stopped Israel from completing the destruction of militants' infiltration tunnels. According to the Kerry and Ban statement, forces on the ground would remain in place during the ceasefire. Israel and Palestinian delegations in the meantime will travel to Cairo for separate negotiations to reach a more durable ceasefire, the statement said. The Palestinian delegation will be comprised of Hamas, Western-backed Fatah, the Islamic Jihad militant group and a number of smaller factions, Palestinian officials said. A senior U.S. State Department official said talks could start as early as Friday, depending on how long it takes the parties to reach Cairo. Representatives from Israel and the United States will not sit across the table from Hamas, the official added. The United States, European Union and Israel consider Hamas a terrorist group. Egypt's Foreign Ministry said it "stresses the importance the two sides respect their obligations resulting from their announcement of ceasefire so that negotiation can be held in suitable condition and achieve the desired results." Fighting continued, however, overnight. Hamas said it fired rockets at Israel, setting off air raid sirens in the area of Tel Aviv. Israel's military said its Iron Dome defense system intercepted one of the rockets. Residents of Gaza reported further Israeli shelling. Previous international attempts to broker a humanitarian truce were less successful, securing shorter periods of calm, some of which collapsed immediately after being announced. U.N. political affairs chief Jeffrey Feltman said it took a massive diplomatic push to achieve the ceasefire. "The Egyptians played an important role, the Qataris played an essential role in helping bring the parties on board, the Turks were in touch with all sides. This was a collective effort,” Feltman told CNN. STRONG DEMANDS Israel launched its offensive in Gaza on July 8 in response to a surge of cross-border rocket attacks. Gaza officials say at least 1,427 Palestinians, most of them civilians, have been killed in the battered territory and nearly 7,000 wounded. Fifty-six Israeli soldiers have been killed in the fighting and more than 400 wounded. Three civilians have been killed by Palestinian shelling in Israel. Netanyahu faces intense pressure from abroad to stand his forces down. The United States and the U.N. Security Council have urged both sides to halt fighting in Gaza to allow in humanitarian relief. Israel has ordered its ground forces to focus on locating and destroying a warren of tunnels through which Hamas has menaced its southern towns and army bases. "Our understanding is that the Israelis will make clear to the U.N. where their lines are, roughly, and they will continue to do operations to destroy tunnels that pose a threat to Israeli territory that lead from the Gaza strip into Israel proper as long as those tunnels exist on the Israel side of their lines," said the State Department official. With Israeli forces remaining on the ground to pursue that mission, it could open the way for Israel to declare it achieved the main goal of its ground offensive and to pull troops out of the Gaza Strip. Kerry, speaking to reporters during a trip to New Delhi, said the parties need to find a way to address Israel's security concerns and to ensure that the people of Gaza can live in safety and dignity. "All the people involved in this have strong demands and strong visions on what the future should look like. Israel has to be able to live in peace and security, without terror attacks and rockets and tunnels and sirens going off in the day," Kerry said. "And Palestinians need to be able to live with the opportunity to educate their children and move freely and share in the rest of the world and lead a life that is different from the one they have long suffered," he added. 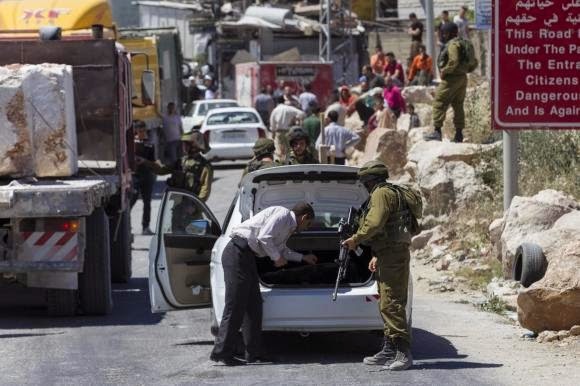 An Israeli soldier searches a Palestinian vehicle at a checkpoint near the West Bank City of Hebron June 15, 2014. 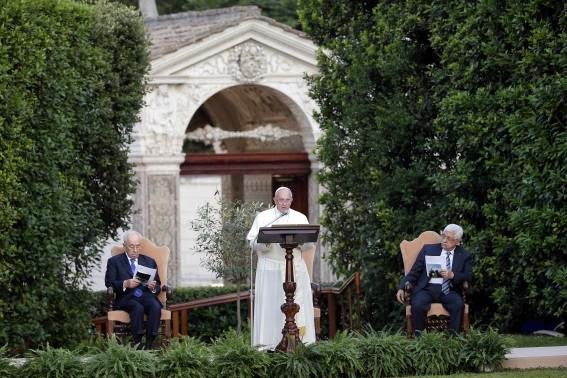 Pope Francis speaks as he is flanked by Israeli President Shimon Peres (L) and Palestinian President Mahmoud Abbas (R) in the Vatican Gardens at the Vatican June 8, 2014.